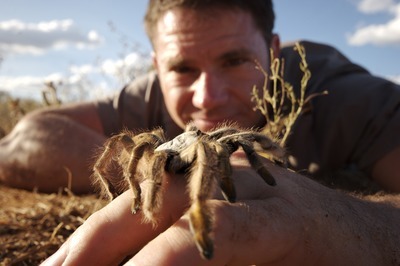 British Wildlife TV presenter Steve Backshall heads to Melbourne on Friday 15 and Saturday 16 January 2016, for a special “weird, wild and wonderful” live show. Deadly 60 is a TV programme hosted by fearless wildlife presenter Steve Backshall. The popular children's TV show documents Steve as he tracks down some of the world's most deadly and dangerous critters. Steve is not only a TV host, but an author, expedition leader, naturalist and wildlife expert. His wildlife adventures have taken him all over the world, from the Arctic to the Antarctic. His explorations have taken him beneath the sea, into the wildest rain forests and up to the top of the world's highest peaks. He has many publications available to buy, and has contributed to the Indonesian Rough Guide. In Deadly 60, Steve has come face to face with the world's most venomous and dangerous animals. He's swum with sharks, been bitten by a caiman, and met a wild Komodo Dragon. Global adventures also involve narrow misses for Steve, he almost got caught up in crossfires during the riots of East Timor. Inspire your children by listening to the adventures of one of the world's most courageous and intriguing wildlife enthusiasts. Deadly 60 Live promises to take you and your children on an adventure of a life time, telling the stories and showing footage from his most famous expeditions. He will also answer your questions about the making of his popular BBC Earth series.